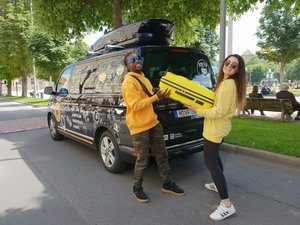 Dublin resident Kenneth Lomena (20) was on the third leg of the European Commission’s “EU Road Trip Project” which started at Donaueschingen, Baden-Württemberg, driving a Volkswagen Transporter (T6) Multivan Highline along the Danube all the way to Romania. He was accompanied by Susann (21 from Estonia). As around 4,000 kilometres were covered by the voyagers, this journey, however, is much more than just a road trip in a T6 passenger vehicle: it provided eight young Europeans the opportunity to discover the EU anew, with all its different people, countries and cultures – and to share their experiences with the world via social networks (Facebook, YouTube, Instagram, etc.). Germany, Austria, Slovakia, Hungary, Serbia, Bulgaria and Romania. Seven countries and one river, which linked them all together: With its length of 2,857 kilometres, the Danube flows through more countries than any other waterway. “The Danube is a symbol that connects culture and people with one another. 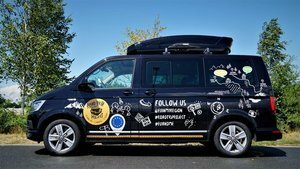 And that is also what the Road Trip Project is about: We want to offer an adventure, a journey across Europe – by and for ‘millennials’. We believe that being ‘on the road’ is the best way to explore things and to meet new people,” explained Michel Gasquard from the Regional & Urban Policy Department of the EU Commission and one of the project initiators. Using a crew casting process, eight Europeans aged between 19 and 26 were selected by the European Commission from a large field of over 2,000 applications. The travellers get on-site support from local celebrities and bloggers, who presented their home region and part of Europe to them. From the experiences and the insider tips from the locals a unique online travel guide was produced. The aim of the project is to create a platform of interaction between young people across Europe.